If you're looking for some paver patio design tips, you've come to the right place. When digging your patio base, make sure to go down 6-10 inches, depending on how much material you use. If you want your patio to last, don't go less than 6". Make sure to use a compactor or a hand tamper after every time you add a new layer. 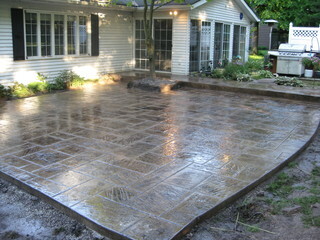 After the pavers are laid in their final place, pour more sand on top and spread into the cracks with a broom. When it's filled, wet with a hose, and fill in again anywhere needed. As a general rule of thumb, for every two linear feet, add 1/4" drop to keep the water away.